“Short and Long Layers Are Hot This Spring,” says David Barron in the Piedmont Review! Q: I just moved to Atlanta from New York, and I am uncertain as to what’s “in” since I’m no longer living in the fashion capital. My hair right now is cut in a Vidal Sasson-style bob, and I don’t have any color on it. I would like to go shorter. Can you give some new styles to consider? – Sue – Atlanta — Read the full article online! Turning 40 Doesn’t Mean You Must Wear Short Hair! Q: I’ve had long hair all of my life, and I am now about to turn 40. I really want to cut my hair short, but my husband really likes my long hair. Can you give me any suggestions so that I can update my hairstyle and keep my husband happy? – Mandy – Snellville — Read the full article online! David Barron Helps to Take The Pain Out of Blowdrying Your Hair! 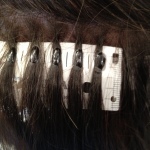 Q: I have very thick, straight hair that is difficult to blow dry. I work out every day, and I don’t have a lot of time to spend on my hair. I also have dry ends, which is a big problem for an active person like me. Can you give me some suggestions that will help save me time and still have a hairstyle that I can feel good about? – Donna – Buckhead – Read the full article online! Q: I have very fine hair, and for the last 15 years, I have worn a wig. I want to know what is the proper way to clean a wig, and find out what styling options such as applying color are available? – Mary – Atlanta — Read the full article online! Q: I am about to be a mom for the first time. I keep my haircut short, but I am tired of the style and really want to do something different. I like it messy on top – I usually use my fingers instead of a brush. I have no idea what I can do with it. Can you recommend some styling options for me? Remember that I’m about to be a mom, so it needs to be easy! – Carol – Atlanta — Read the full article online! Q: For more than a year, I have been growing my hair our so I could have some length for my wedding. I just got married, and I am ready to cut my hair shorter. Right now, my hair is past my shoulders and has very long layers in it. Can you give me some style options to consider for a new haircut? – Dorothy – Brookhaven — Read the full article online! “Consider The Shape of Your Face When Choosing A New Hairstyle,” David Barron suggests in the Piedmont Review! Q: I live in a small town in Georgia where there are few hairdressers to go to on a regular basis. I have a very long face, and every style I try doesn’t seem to go with the shape of my face. Can you give me some haircut suggestions that look good on long faces? – Debbie – Stockbridge — Read the full article online! Q: I am getting older, and over the past year my hair has begun to fall out. My hair is extremely fine and thin, so it’s quite noticeable. I have purchased a few wigs, which I now use frequently, but I would like to get some suggestions for some other hairstyles or hairpieces. I want to look young and attractive – not bald. Help! – Maggie – Atlanta — Read the full article online! David Barron Gives His Styling Tips in The Piedmont Review! I have very long hair, and I’ve been getting a “piggy-back” perm for the past five years. For a while now, my stylist has been telling me that perms are out, but I like the way the perm gives my hair shape and body. I think that he doesn’t like how long it takes to give me the perm – it takes over an hour just to wrap my hair. What are your feelings about perms? Are they really “out” and should I take his advice and stop getting them? – Shirley – Stone Mountain — Read the full article online! Q: I have had shoulder length hair for quite some time. It is all one length, and I am considering asking my stylist to cut some bangs to update my hairstyle. One of my concerns is that I think that my forehead is a little big, and I am worried that bangs might exaggerate it. Do you have any suggestions? – Rosemary – Buckhead — Read the full article online! David Barron Gives Advice on Preparing Your Hair For Your Wedding Day! Q: I am getting married in Columbia, South Carolina at the end of September. I do not have a hairdresser there, and I am trying to find out what options I have. When I talked to my stylist her in Buckhead about what I should do, she told me she only specialized in haircutting and coloring – not hairdressing – which didn’t give me much hope that my hair would look good on my special day. I also do not know how I should wear my hair. I feel very stuck, and I only have a month to figure something out – HELP! What would you suggest? – Wendy – Atlanta — Read the full article online! David Barron Answers Your Questions in The Piedmont Review! David Barron, the charming owner of Barron’s London Salon in Buckhead, has been styling hair in Atlanta and his native London for more than 14 years. He was trained by internationally recognized hairstylist VidalSassoon, has worked in one of the top salons in Atlanta and opened his own salon in 1996. He is extremely self-confident, has an incredible accent and sees himself as both a hair designer and psychologist. It only takes a conversation with Barron to conclude that hair and his family (not necessarily in that order) are his passions in life. — Read the full article online! 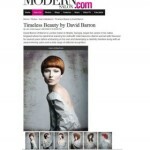 David Barron’s Spring Color Concept Featured on Modern Salon! 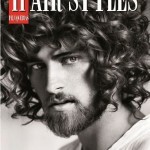 Atlanta hair stylist, David Barron, featured on Stylenest.com.”It’s all about the long, ruffled styles. Previous bobs have been straight, sleek and shiny.” says David Barron, owner of Barron’s London Salon. Check out the full article on Stylenest.com. Atlanta hair stylist, David Barron, featured on ModernSalon.com. 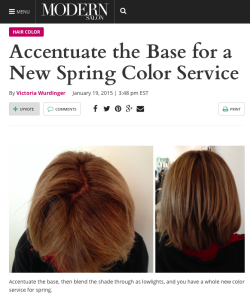 For a great new spring color concept, accentuate the base, instead of breaking it, says David Barron, owner of Barron’s London Salon in Atlanta, Georgia. Check out the full feature on Modern Salon. 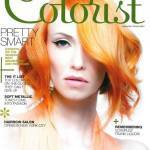 David Barron’s Precision Cuttery Featured in Colorist! Top Atlanta hair stylist and salon owner David Barron was featured in the September 2014 issue of Colorist! magazine. 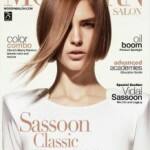 David Barron’s precision cutting skills are evident in the beautiful, dreamy cut seen on the model shown on the cover. Click here to see it. David Barron, a top Atlanta hair stylist and founder of Barron’s London Salon, was featured in Peluquerias Magazine for his hair styling talent and ability to create a unique look. Check out his page in the July/August issue of Peluquerias Magazine! Congratulations to our very own David Barron, a top Atlanta hair stylist and owner of Barron’s London Salon. David was recognized as one of the 2014 North American Hairstyling Awards finalists, and was featured on ProBeauty.org. 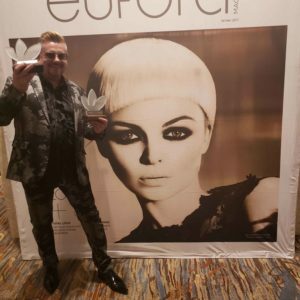 Top Atlanta hair stylist David Barron was featured in Modern Salon as one of the NAHA 2018 finalists. 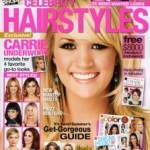 Check out the article at ModernSalon.com. David Barron discusses the diverse clientele that visits Barron’s London Salon with Salon Today. According to Barron, the salon caters to those looking for the perfect hair color. Every stylist at Barron’s London Salon performs advanced color techniques that consistently exceed client expectations. The hairstyles featured in David Barron’s Timeless Beauty reflect his Sassoon training and expertise with color and texture techniques. The work of top Atlanta stylist David Barron was showcased in Hairbrained.me’s August 2012 avant garde feature. Atlanta stylist David Barron shares his secret for adding waves to fine hair. He recommends the use of texture sprays to enhance the bend and curl of your hair. David Barron, owner and founder of Barron’s London Salon, offers advice on how to grow your business. Barron says that his approach is to “suggest, not push” and to always put to the needs and desires of the client first.